Well, yes. I might be nuts. And I might be nuts for a lot of reasons. Having a good ten embroidery projects going at once could be one reason. But this – this project that I’m working on, that I’m going to show you today, involving 56-count silk gauze – it’s not nuts! It’s engrossingly satisfying. It’s addicting. It’s strangely compelling. It’s habit forming. It’s instructive. It’s colorful. It’s fun. It’s challenging. And if I say it enough times, I will believe it. Natalia Frank, from Dollhouse Needlepoint Patterns & Kits, is the designer of this particular piece. 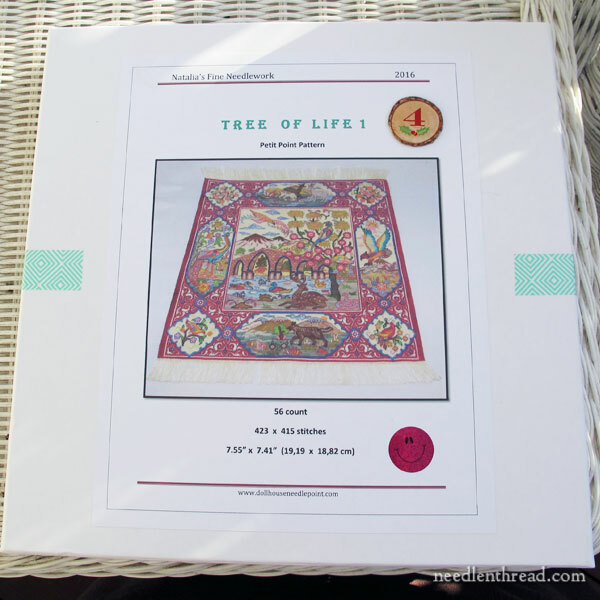 It’s a miniature tree of life tapestry, worked on 56-count silk gauze with silk threads. She sells both the pattern and the kit here, though right now they are both sold out. I first came across the piece on Facebook, when Natalia posted her finish on it. At that time, it wasn’t available as a kit, but I signed up for her newsletter, and as soon as she announced that it was available, I jumped on it. There were only five full kits available at the time, and they sold out pretty quickly. Now, before we go too far forward with this, I better mention a couple points. I’m sure you’ve noticed that I don’t feature a lot of counted work on Needle ‘n Thread, because my website is devoted to my First Love of Needlework, which is surface embroidery. I don’t do a lot of counted work, because I’m not, in general, drawn towards counted work. But I do like certain types of counted work – including miniature petit point on silk gauze (like this piece). The framed piece I showed you Monday in the framing tutorial is the same type of work. Other types of counted work that I like and will occasionally indulge in include blackwork, counted bead embroidery, some types of drawn thread, pulled thread, and Hardanger, which can all be counted work, depending on how they’re designed. But, in general, I don’t do a lot of counted embroidery stuff. I have nothing against it, but it’s just not my first love. However, when I do come across a piece of counted work that I love, I’m all in! And that’s the case with this particular piece. Even if you don’t do counted thread embroidery, though, there’s still a lot you can learn from a project like this, that you can apply to your other embroidery and needlework pursuits. I’ll be sharing my progress on this particular project, then, and hopefully, we’ll discover some universal stitching tips along the way! I always like to show you a kit and tell you about it, before I start showing any progress on it. That way, as the piece progresses, I can refer newcomers back to the original starting point and the kit information. This is a picture of the photo on the front of the kit box. It should give you a relatively good idea of what draws me to this particular piece. While the piece is finished as a rug here (for a doll house), that’s not my intention for my finished piece. I’ll most likely frame it. I love Tree of Life designs. They have so much symbolism in them, and they offer so many possibilities for abundance in color and design. This kit has it all – symbolism, color, abundance of design elements. And it’s all tied together with a background reminiscent of an opulent Persian rug. The color in the photo above looks more like a rather bright cranberry, but in fact, the overall background color is a deep reddish burgundy. It’s rich! I have to say, this is one of the Most Organized Kits I’ve ever seen in my life! It’s extremely well put-together. It’s assembled in a way that makes it really easy to tackle the project. Instead of a huge stack of chart pages, the charts are broken down into specific elements in the whole piece. So, for example, everything for the bird medallions in the corners are packed separately within the box. 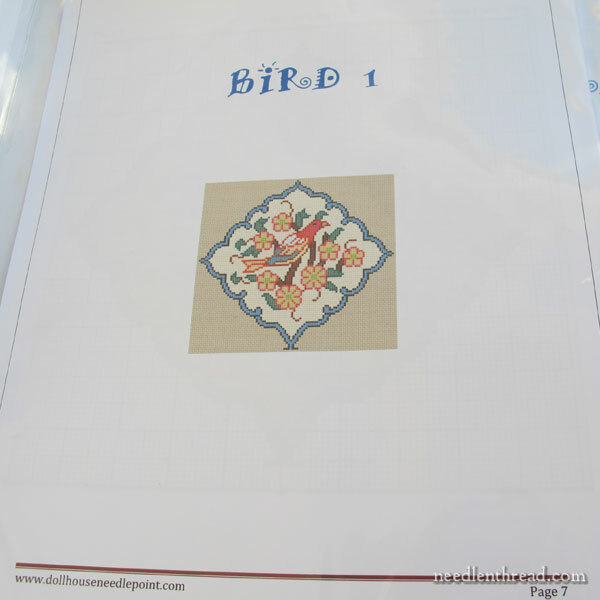 In the package for the bird medallion #1, for example, you’ll find the charts for that medallion, plus a color key, and a color card with all the silk threads needed for that particular little part of the whole project. Each bird medallion, then, has it’s own little “kit” within the kit. There’s a package for the background of the whole piece, with two types of charts in it. Six charts break the whole background up into six pieces. The grid for those six charts is relatively small. And then there are close-up charts, with a much larger grid that’s easy to see. The threads for the background are all contained within the “background” kit. Then there’s the “field” kit, which pretty much comprises everything else – the center part of the design and the four side panels. The field kit is broken down further into sections, so that you can easily find all the charts for each panel, and all the charts for the central field. 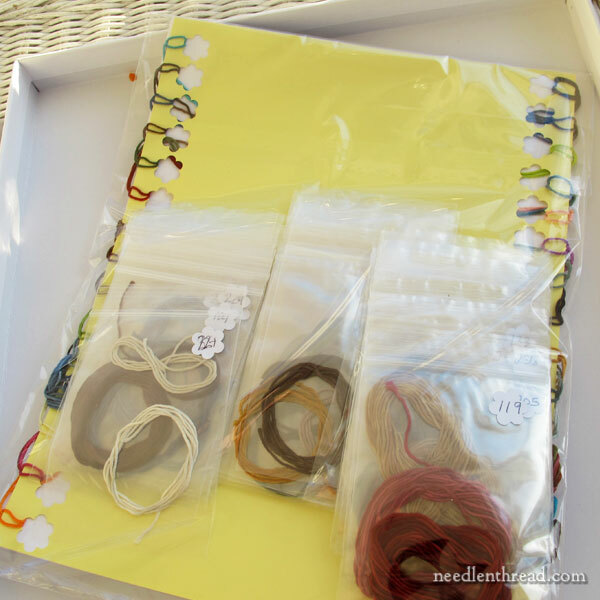 All the threads for the “field” section are packaged either on a large card marked with the thread colors, with the threads looped into cut holes (the yellow paper in the photo above), or, for larger quantities of thread, in plastic bags marked with the color numbers. The thread used in this particular kit is Gloriana’s Tudor silk. It is a tiny spun silk floss that’s hand-dyed, and has slight variations in it. The variations in the thread really add a lot of depth to the piece. It works super well on the background especially, lending that look of “plush carpet-ness” to it. This is the first time I’ve used this particular silk thread, and my mind is whirling with possibilities for it. It’s quite fine (finer than a single strand of DMC, for example), it has just a slight twist to it, and I could see it working really well in certain surface embroidery applications. I may have to explore this thread further…! What Else is In the Kit? Besides a boat-load of charts and instructions and 89 colors of silk, all organized either in bags or on cards, the kit comes with 56 count silk gauze and needles. Next up, I’ll talk about mounting the silk gauze and getting the first stitches in. I’ll also cover some mistakes I made. Oh yes. It didn’t take me long to make them, either! And I’m thinking about re-organizing the floss, after running into some little quirks with the way it’s arranged, so I’ll chat with you about that down the road, too. This is the type of project that makes a great 15 Minutes project. That’s not to say it only takes 15 minutes. No No! The piece is 423 x 415 stitches (or 175,545 stitches), so it’s not going to be a quick one. But I’m setting it up so that I can put in 15 minutes of stitching here, 15 minutes there (or half an hour here and there), and I’ll be using it as a carrot. I find it engrossing, and I love to see even the tiniest bit of development on it. It’ll make a good motivational project, encouraging me to get things done efficiently so I can spend more time with it! Stay tuned for future developments! March 18, 2011 Miniature Embroidery Project Update! That is GORGEOUS! I can see why you were drawn to it, Mary! The count would have put me off, but now seeing your post about how the kit was put together, it seems very manageable. That is an absolutely brilliant way to chart and package more complicated designs, so kudos Natalia Frank. I’ve only done 40 count silk gauze, a very tiny project. But this is certainly tempting! I find counted work very challenging. It keeps your brain alert. Not boring by any means. I like the miniature concept. You would be surprised at the number of adults that have elaborate doll houses! I love the idea of an elaborate doll house that develops over time – but it would never work for me. I don’t have anywhere to display or keep one, as my house is very small. Still, I think they are absolutely fascinating! I just like Small Things! Hi, Maddy – when I use a magnifier, I use either this: https://www.needlenthread.com/2010/11/the-dublin-craftlite-magnifier-light-combo-review.html or I sometimes use these CraftOptics: https://www.needlenthread.com/2013/04/craftoptics-so-you-can-see-the-details.html The latter are pretty expensive, but if you do detail work and you have eye problems, they’re great! On this particular piece, though, I’m not using any magnification – just good lighting and my bare eyes. If I take my glasses off and situate the frame about 6″ from my face, I can see it perfectly. I have pretty bad eyesight for distance vision, and a light “reading” prescription at the base of my lenses (progressive lenses), but I can’t find the “sweet spot” to see the 56 count grid (even with magnification) if I have my glasses on. Without my glasses, though, I can see it perfectly, as long as it’s close enough to me. My eyesight changed pretty drastically last year due to chemo, and now, I just can’t seem to get the right ratio with the distance vision and reading vision. I’ve tried lots of approaches, even having a pair of bifocals specially made with increased magnification for detail work, but the naked eye just seems to work better, so that’s what I’m doing right now. With regular embroidery that’s not this small, I can use the regular craftlite magnifier if I need it. I’m not drawn to counted work myself (I’m too impatient and not precise enough, I think! ), but I agree that pieces like this make me see the appeal! Large counted work pieces always look so overwhelming to me, so I find the organization of this to be very impressive and user-friendly. 🙂 Can’t wait to see your progress pics! This is an absolutely amazing project! I so admire your work. What are the project measurements? 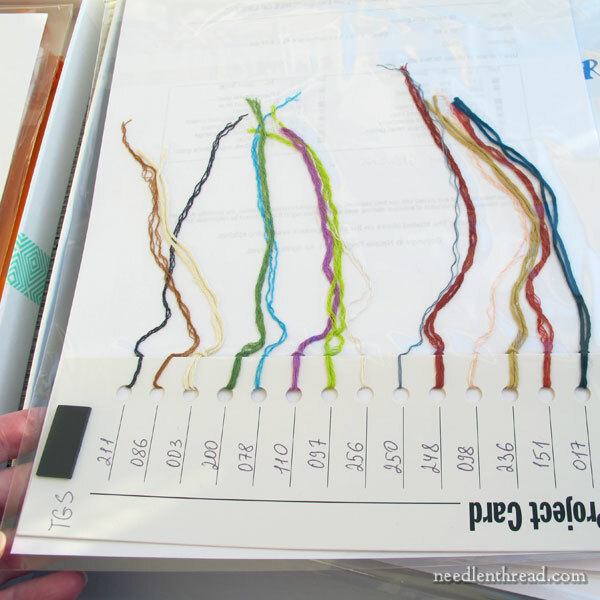 Do you use loops or a magnifier to see the threads? That has to be hard to see! I can’t wait to see your progress!! Hi, Sarah – the finished piece is somewhere just around 7.5″ square-ish (it’s not quite square – there are 423 stitches horizontally and 415 vertically). I can see it fine without my glasses and without a magnifier, as long as the frame is pretty close to my face (about 6″). If I’m wearing my glasses, I can’t see it as well, so I do it without glasses. And the magnifier, with my glasses, works “ok” – but it’s perfectly clear with just my eyes, pretty close to the face. Gorgeous !! 56 count,,,,,, Yikes!!! What kind of Eyeglasses do you wear ?? I want a pair too!!! Hi, Lynn – strangely enough, though I’m pretty much blind without my glasses, this piece gets naked eye treatment. I use a table stand to hold the frame, and it’s about 6″ from my face. Without my glasses, I can see it perfectly. With my glasses – even though they are progressive lenses so that I can see when I read, too – I can’t find the “sweet spot.” Without my glasses, and without a magnifier, though, I can see it perfectly! Problem is, if I have to look up and away at something in the distance, forget it! I have the chart folded up to reveal just the section I’m following and stuck on the frame with magnets, so it’s right in front of me, too. It works! It works perfectly to read the diagram with the usual glasses and to see the stitches with the magnifier at the same time orienting the magnifying lens that clamps on the glasses. Thanks for sharing your method! Isn’t it wonderful when a certain piece calls you to it and no matter how easy or complex it is you know you have to do it. Part of enjoying the project is the preparation and coming up with clever solutions if needed. The journey of choosing colors, the fabric, transferring the design is just as exciting to me as it is when I can finally sit and start stitching. Challenging piece, but a fun journey! Tree of Life is absolutely gorgeous! You’re right! I’m afraid, though, that with my macular degeneration, it’s beyond my ken. but thank you for sharing it with us. It gives me hope. And it give me joy! And it shows me Life! Aloha. I am speechless and that just doesn’the happen very often. I found you through the 1 Year of Stitches project. I can’t wait to tour your site. I am new to embroidery and this is nothing short of inspiring. Thank you for sharing. This is such a lovely project! I’m absolutely in love with it, even though I’m not usually into that kind of look/project. Unfortunately, the dollhouse site is down. May I ask approximately what the kit costs? I hate talking about money, but I’m a college girl here! Hi, Emma – she sells the full kit (out of stock right now) for $165, but you can purchase just the chart, or you can purchase small excerpt charts of the piece – the various birds, the side panels – as individual small charts, too. I have done cross stitch and hardanger for counted needlework. Doing the same stitch over and over, even with color changes isn’t for me. I loved doing the hardanger though. This kit is gorgeous and tempting, with some great ideas for kitting up projects ourselves. Mary, not that I’m trying to lead you into temptation, but rather than a full-out miniature house sitting on a table, what about individual rooms that hang on the wall? To keep them not so deep, it could lead to experiments with fool-the-eye perspective tricks to make it look like full-depth rooms. You did a wonderful job of showing us the details of the kit. Everything you said made me love it more. I actually like it as a doll house rug-but is any dollhouse worthy of it? It will be fun to follow your progress on this one. I forgot to say that when I’m working on the small stuff, I either take of my glasses & hold it close, or if I want to look up and away, at the TV for example, I have taken to wearing reading glasses over top of my regular progressive bifocals. And lots of light!. It might be just me, but forget those magnifiers that hang around your neck! When I tried one, I could not get it set where it was in focus AND light reflections were not blocking the view. Mary, First, i want to say that I look forward to your posts. It’s as exciting as getting my favorite magazine in the mail. So I want to thank you! The question that I have is: what do you use for lighting and good vision when doing miniature embroideries? I have looked at OTT lamps with the magnifying glass but I want a comfortable lighting. Also something affordable and not in the hundreds of dollars. I am not sure if you have posted anything in previous years but would appreciate a any input you can give me. oh my gosh, that project looks amazing! I’ve been tempted to try a silk gauze project, but it does seem intimidating! I will be looking forward to watching this project take shape! WOW!!! I can’t wait to join you in this amazing project! You will do this work of art great justice. Thank you for sharing the process with us. The Tree of Life looks a lovely project to embroider with so many different colours and nature aspects to it. It also looks very challenging but interesting I look forward to your progress on the project as I did with the Cluny tapestry you inspired me with your 15 minute stitching I thought you wouldn’t finish it but I now see that you have not only finished the project but have framed it as well great stuff. I like the way the kit charts are broken down into different parts makes it easier to concentrate on one piece at a time. Thanks for sharing your new tapestry project with us, I look forward to your progress and learning new tips and techniques as we go along. I’ll be following along with this one with much excitement. This is my favorite kind of needlework and I just don’t have the time or the space to devote to it just now, but I can live vicariously through you! And I can pick up some tips and techniques along the way! thanks for all you do. I just love your site. I don’t usually do counted work because quite frankly I think I’m a little dim when it comes to counting. I get very confused and lose my count quickly. Also I never know where to start. I know they say start in the middle but I have a hard time doing that. With surface embroidery I can start anywhere, most of the time. I really like some counted kits like the one above but shy away from them for those reasons. Hi, Melissa – if it helps any, I never start in the middle! I have recently arrived on your site and really happy to find so much information about what I like best as hobby. I did not know this type of embroidery but I find this very challenging, and I just launched this challenge on January 2 with a project of ” Tapis Pekin” of “Le Bonheur des dames”, a 206×320 stitches on linen with 17 shades of blue and beige. I’m very happy to follow you on that so impressive counted thread embroidery. I adore counted work myself but find embroidery so fascinating with all the possibilities. In cross stitch I finish off a thread by running it under some stitches on the back. On the fine gauze like this project and the count is so high, how do you finish off a color? Seems like the stitches would be too small and snug to run a needle under the back threads. The tree of life project is just amazing. It will be quite an accomplishment when you finish it. Yes, I would also frame it. I have done lots of counted cross stitch, and I do find it satisfying. I like to watch the picture form. I’m about to set up a petti point cross stitch. I bought a pair of magnifying glasses, even though I ware tri-focals. It does make the project go better. Petti point does make a good 15 minute project. My passion is still surface embroidery. Alright Mary, I’ll pretend it’s not nuts also! I can’t wait to see how it progresses. I’m always impressed with the challenges you set yourself, and learn so much from you. This is a beautiful design! I also love Tree of Life designs, especially the animals–deer, rabbits, birds, squirrels, etc. And I’m really impressed with how the kit is organized. It makes it seem like nine smaller projects that are patched together by the background. When you started the Cluny Project several years ago, I was in awe. The stitches were so tiny. With each update on that project, I was even more in awe. Your post on framing a project was great, and it was a delightful surprise to see the Cluny Project framed and finished up. Lovely! But beautiful designs in rich colors aside, I’ve never found the appeal of counted stitch work. I enjoy surface embroidery–in several forms–as well as needle lace and stumpwork. But for counted cross stitch, petit point, quilting, hardanger, and other fiber arts, I’m an enthusiastic spectator. I love going to quilt shows; I have several books on crazy quilting; and I follow a couple of knitting blogs even though I don’t knit. 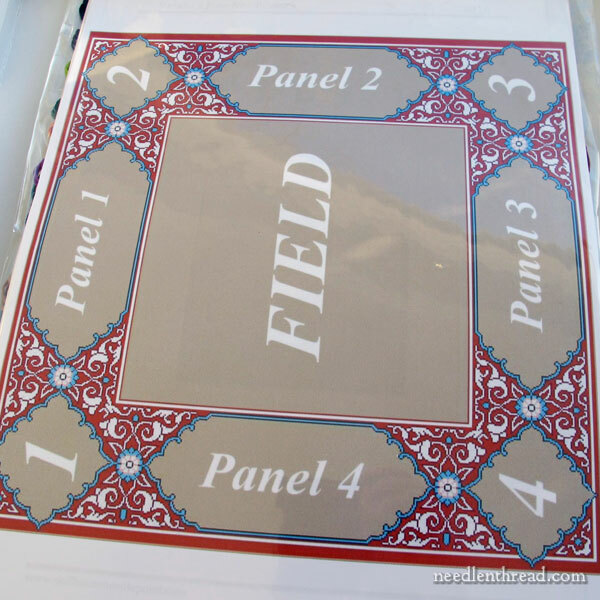 I’m OK being on the sidelines–cheering on the other embroiderers and fiber artists! I look forward to seeing the progress on this project, Mary. I want to know where you’re going to start, and I’m hoping that your photos will show the true burgundy color. And when you post an update, take a moment to listen . . . you just might hear a soft sound of cheering. You wrote the material for the carpet is 56 cnt??!! What are you using for magnification while you sew? Wow, I imagine you have sold a lot of these now, Mary! It sure is tempting. I expect that the effect with that hand dyed silk is stunning! And I also love the subject matter — something to consider for a future project, I think! I am thrilled you are going to talk about this project! I could never get my mind behind counted work but I always loved the kits and possibilities. I would end up counting wrong and never knew how to fix those tiny stitches without everything unraveling. Oh my. I want it! It is probably out of my price range but this is absolutely beautiful. I like higher thread fabrics for cross stitch because I like the look of threads against a tighter weave of fabric. This is gorgeous. There is so much to look at in this piece. And I have mag 5 reading glasses to do higher count. It makes 40 count look like a 20 count. When I searched reading glasses I also saw a pair of 7 mag. May have to buy them!!! Thank you for a delightful share! Thank you so much for all the invaluable information that you have provided. I have learned so much from you. I wish you the very best in 2017. And again thank you so much for sharing and willing to be part of this large interconnected world. Probably the most gorgeous piece of counted work I’ve ever seen. Amazing! Yes Mary you are nuts….. and younger than me. 56 count?! and counted?! I don’t have enough years left to take that on. Never did like counted x stitch … doing it that is. My last full counted piece was Marilyn Monroe. That was a piece for idiots. Me, it was just an outline of her face and filled in red lips. An earlier one was a counted little carpet. No, No. Kill me if I ever suggest that again. I am not yet doing painting by numbers or braille. Love the work I have seen I certainly admire the those who do it, but no thanks. Happy 2017 to all. May all your troubles be little ones and your joys the best you ever have. 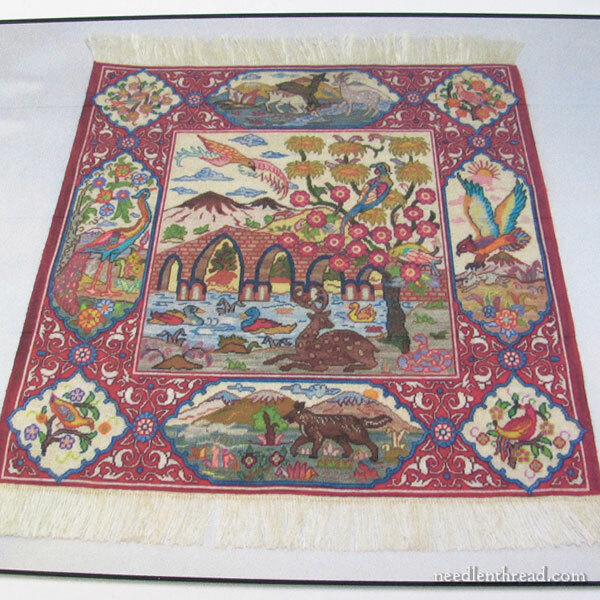 Hi Mary….I’m an occasional reader of your blog and when I came across your entry about Natalia’s Tree of Life carpet I was surprised that you didn’t mention the following… or was she too modest to tell you about the PIMA award? “OOAK and an award-winning rug Tree of Life 1 is stitched on 56 count silk gauze with over dyed Tudor Gloriana silk floss with 89 colors (93 skeins total). The above award is major and Natalia is a major contributor to the worlds of both miniatures and needlework. I’ve been involved in the worlds of both of those “sports”) needlework and miniatures) for decades and can vouch for her being a huge talent in both fields. I have been making mini Persian rugs for some time now, bought discarded books on the subject and went from there. Used 22 canvass and Paternayan yarns. Have made several which are copies from museums or private collections. Sorry, can’t enclose photos. I love what you are doing with his project, it is such a pleasure to work on such tiny embroideries, one has to experience it and feel it. I just finished a study of heavenly beings and realized that the cherubim were the ones who guarded the entrance to the Tree of Live in the Garden of Eden. This embroidery is really nice and has several familiar symbols, but not the cherubim. That is unfortunate. First I have to say it is amazingly beautiful! I’m also drawn to the tree of life designs, so this one just may have moved to the top of the list. Ok, 56 count, is it really hard to see the holes…lol. I have to ask because I have issues with my eye sight. My other question, I didn’t see where to order the kit from? I did find the website. As much as I’d love to,try my hand at this one it’s a bit too steep for me. I’m on a disability budget. BUT……I am going to try one of the smaller pieces with the peacock on it. I’ll just have to save for a bit…lol but it will be worth it. I love everything about the one you’re doing. It’s amazing to,say the least. And I’m going to be watching as you post more on it, so I can learn as much as I can before jumping in! Yes, I’ve done 40 ct gauze with DMC. It should work fine! Did you ever get around to finishing your wonderful Tree of Life project? I have not finished it yet, but it’s waiting patiently on my work table. Perhaps in the quiet doldrums after the holidays, I’ll be able to tackle this one again!